You don’t need a master’s degree in marketing to understand that quality customer service is crucial to the long-term success of your business. Your existing customers will become your most vocal advocates and help grow your customer base on your behalf if you provide a worthwhile and memorable experience each and every time. What does a worthwhile and memorable experience look like between a business and a customer? This type of experience is one where the business caters to the needs of the existing and potential customer before, during and after they’ve made a purchase. Questions, comments and concerns of the customer are listened to by the business, giving the customer an open dialogue to quickly deal with any issues or concerns they’re having with your products or services. How can my company create an engaging experience for my existing and potential customers? We started by adding a live chat to our website last week, to build rapport with our visitors and answer any questions a future client might have 24 hours a day, 7 days a week, 365 days a year. The first 72 hours with our Live Chat has been a real opener and I would highly recommend to other businesses selling any product or service. Adding live chat functionality to your website allows customers to chat with a business in real-time to ask questions, get advice and build confidence during their shopping experience, while improving conversion rates for your business. 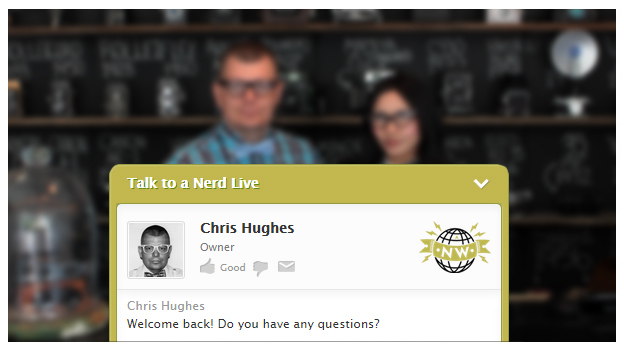 If you have a question, feel free to try our new Live Nerd Chat today.